Ever played a classic platforming video game and wished you could play as the boss at the end of a dungeon? Well, thanks to Boss Monster and Boss Monster 2, you can at least play out a table-top card version of this fantasy. Dear Husband had both of these games on his Christmas list last year, and I — um, I mean, Santa — got them for him. 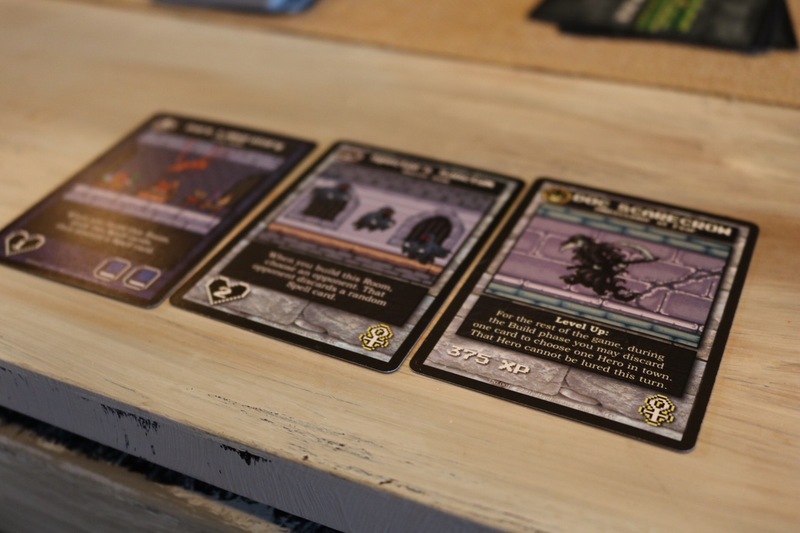 We’ve been on a pretty big Cards Against Humanity kick in all of our family get-togethers this winter, so we just got around to checking out the Boss Monster games this past weekend. 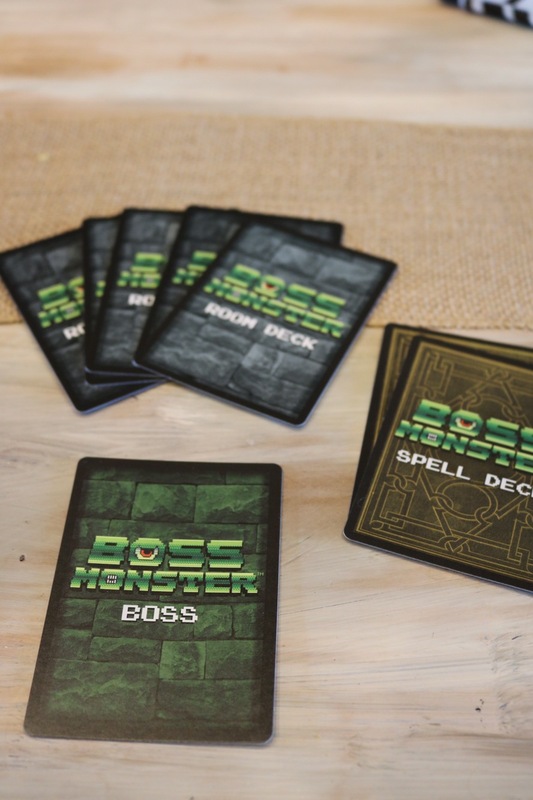 Compared to many table-top card games, Boss Monster is relatively simple in its structure. Each player plays as a boss monster (shocking, right?) and builds a dungeon to lure and kill unsuspecting heroes. A player wins the game if they manage to lure and kill ten heroes. But careful! If a player makes it through your dungeon alive, you take a critical hit. Five critical hits and you die. The game begins simply enough: Each player is dealt a boss card at random. This way, you cannot strategically choose the monster you want to play as. Each boss monster card has a description of the perk you get when you level up (which occurs once your dungeon has five rooms). Then, each player is randomly dealt five room cards and two spell cards. Room cards do exactly what their name suggests: they are rooms to add to your dungeon. Each room has a symbol in the corner indicating what type of hero it will lure, as well as the number of hearts it will take out of the heroes it lures. 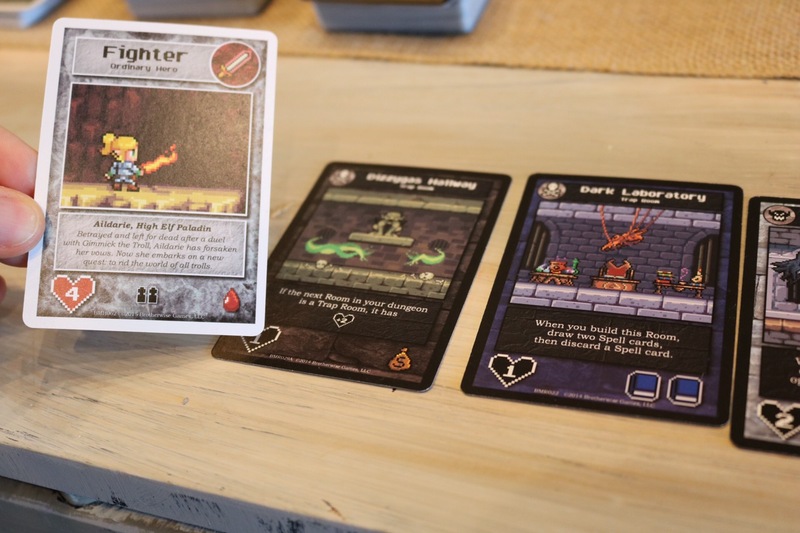 Spell cards may be used either to harm a fellow player, or to harm heroes making their way through your dungeon, depending upon the specifications of the particular spell card you are playing. My biggest criticism so far of the game is that there seem to be too many duplicate room cards. Twice in a row when playing this weekend, my husband and I each played the exact same room cards in the exact same order, causing both turns to be a draw! When it is time to play, each player places the room card they have chosen face down, and then both reveal their rooms simultaneously. 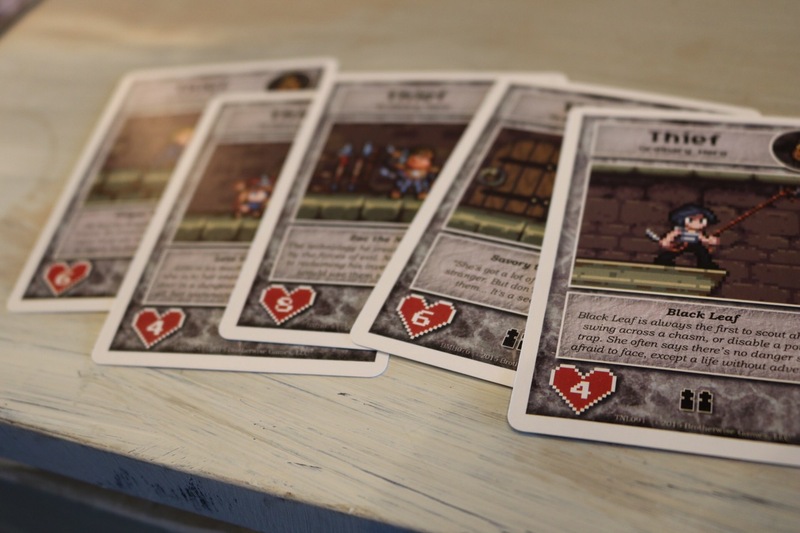 The heroes, who are drawn randomly, five at a time, will be lured to either player’s dungeon, according to the treasures appointed on the chosen room cards. For example, the Thief shown in the photo below will be lured to the player whose dungeon contains the most gold sacks. Having a hero go through your dungeon is where my biggest criticism of the game lies. Although, perhaps it is not so much a criticism with this particular game, and more of an issue with many table-top games in general. For all intents and purposes, having a hero fight her way through your monster’s dungeon amounts to literally nothing more than basic arithmetic. Does the sum of the numbers on the hearts on your room cards exceed the number on the heart in the bottom of her card, after accounting for any spell cards that have been played? If yes, you have slain the hero. If no, she escapes alive. Of course, I do realize that virtually all table-top games boil down to basic arithmetic, often from the likes of twenty-sided dice. But still, I wish there were a way for Boss Monsters to feel more substantive, whether that be from having more of a story, or some added element of adventure and suspense. I will admit: when we first played this on Saturday night, while we were over at my father-in-law’s house for dinner and games, I really didn’t like it. It felt too basic and, therefore, pointless. However, when we played another couple of games on Sunday, I started to appreciate it more. I must say, one of my favorite things – aside from the endearing twist on a classic game trope – is that there are loads of Easter eggs hidden in the various cards, all references to nerdy classics. All in all, I don’t love it, but Boss Monster is a fun little diversion. Tell me, have you played Boss Monster or Boss Monster 2? If so, what did you think? I love Boss Monster! My wife and I have both versions as well as the expansions. We’ve introduced the game to friends from many walks of life and generally have a very positive reception. It’s definitely not our go-to game for story, though. But the Easter eggs are certainly delightful! I didn’t realize they had expansions! Do the expansions provide significantly more room cards? As I said in my review, the high degree of repetition of room cards was probably my biggest issue. The Easter eggs, though, were awesome!!! I can’t wait to play again and discover more! 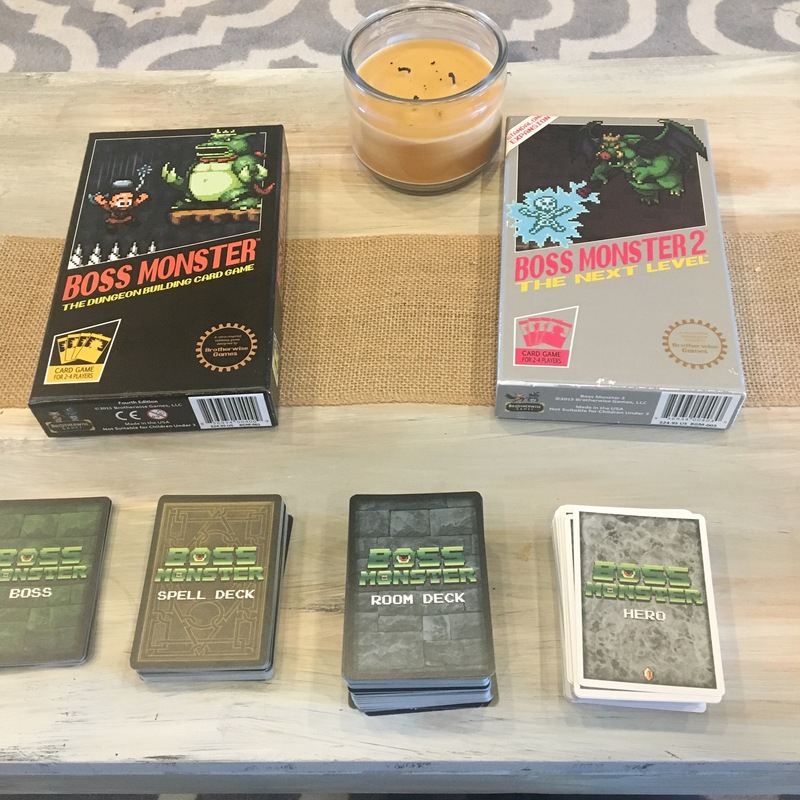 Boss Monster II is better for room-card variety than the first edition. And you can run them together for a much greater variety in the deck. The first expansion is Tools of Hero-Kind. It adds Item Cards to the mix, which heroes pick up as they go into town. It makes them more dangerous, but if you defeat a hero with an item, you get the item for a beneficial one-shot effect. There are maybe four new rooms I think that compliment the item cards, as well as a couple item-related spell cards. Crash Landing is the second expansion and it adds a new treasure type and hero type so that the game can accommodate 5-6 players instead of just four. 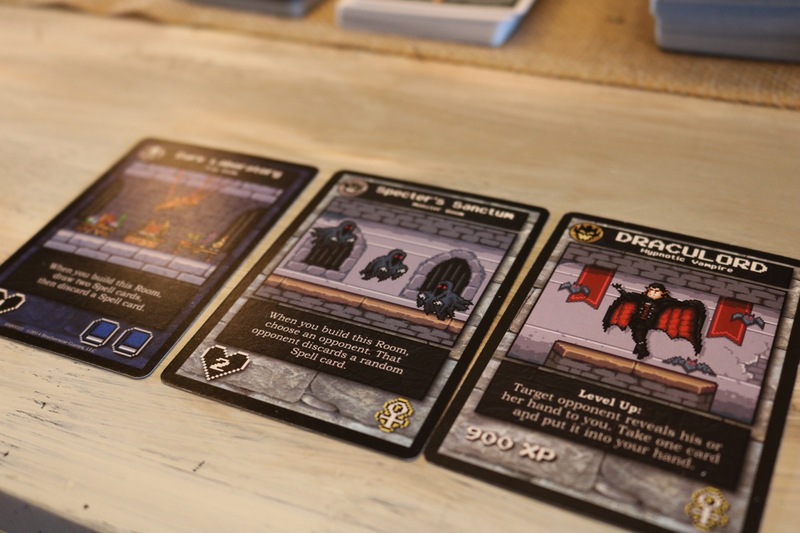 It comes with new rooms, heroes, and spells to expand the decks for a six player game. I’ve never tried it with only four players to see if it still holds up – it’d probably throw off the balance a little bit and make it easier to win before Epic Heroes started showing up, but it may not break the game. Very cool! Thank you for sharing all of this. That is especially good to know that the game can be expanded to up to 6 players. That was an issue we came across the other night, as more than four of us wanted to play. You’re welcome! I have Crash Landing but haven’t actually gotten to play it yet, so I can’t say for certain how smoothly (or not) a six player game runs. But the option is there either way. If you ever do play it with six, definitely let me know how it goes!